Some thoughts on being a trillionaire and inflation. 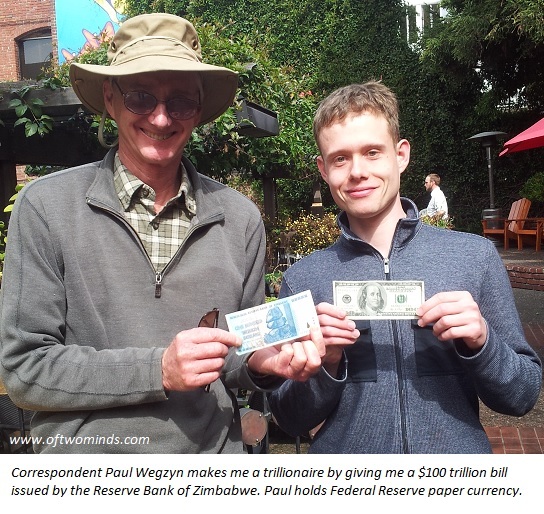 These photos illustrate the fundamentally arbitrary nature of fiat (paper) money.Why do we prefer the $100 greenback over the $100 trillion note issued by the Reserve Bank of Zimbabwe? The purchasing power of the Benjamin far exceeds the purchasing power of the $100 trillion bill. But the Benjamin is not immune to inflation; the dollar has lost about 95% of its 1900 purchasing power. Why hasn't this massive reduction in purchasing power impoverished us? All other things being equal, such a massive reduction in purchasing power means we can buy a lot less with our money. The answer is that our incomes rose even faster than inflation. If it now takes $20,000 to buy what $1,000 bought in 1900, and we earn $30,000, despite the horrendous decline in the purchasing power of the dollar, the purchasing power of our income has gone up by 50%. If wages rise along with inflation, then we don't experience any loss of purchasing power as zeroes are added to our fiat currency. If wages increase at a rate above that of inflation, we gain purchasing power. If wages increase at a rate below that of inflation, we lose purchasing power. It is generally accepted that official measures of inflation do not reflect the "real" decline in purchasing power. Nonetheless, it's instructive to ponder the consequences of understated official inflation on the purchasing power of income. Let's turn to the Bureau of Labor Statistics (BLS) inflation calculator. It now takes $1.35 to buy what $1 bought in 2000. Many wage-earners have received modest increases in their earnings over the past 12 years. Let's say someone received a cumulative wage increase of 15% since 2000. Measured in purchasing power, their income has declined by roughly 20% in a mere 12 years. If we use alternative measures of inflation, the decline is more on the order of 30%. 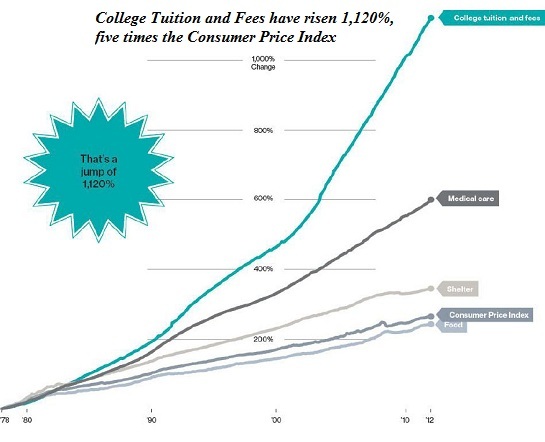 Consider the rising costs of higher education and healthcare: These major lifetime expenses have skyrocketed far above the modest 35% official inflation rate since 2000. This raises another question: what causes money to lose purchasing power? The basic answer is that all fiat money--paper, electronic, credit-money, etc.--is ultimately a claim on a real-world income stream, resource, good or service. If we print/create ten times more money, we cannot print ten times more oil, cans of beans, concrete, etc., and so the nominal price of the real-world goods rises ten-fold. If the money supply rises along with the increase in production of goods and services, then inflation is close to zero. This was the case for much of the 19th century in Great Britain. If there is insufficient money in circulation to fund new enterprises and trade, the economy stagnates. The solution to this is credit: trade credit, loans, etc. Used wisely, credit leverages productive growth in a cash-starved economy. When credit is expanded in near-infinite quantities at low interest rates, however, borrowed money flows into unproductive mal-investments. These go bust and the debtor is left with the interest payments. As a result, massive expansion of credit also leads to stagnation as more income is devoted to debt service and capital accumulation dwindles. 1. 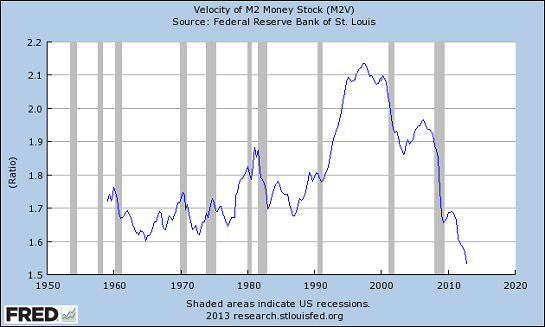 If money is being destroyed by bankruptcies, writedowns, etc. at the same time it is being created, the money supply will only expand if the new money exceeds the money that has vanished. Indeed, if $10 trillion has disappeared from the net-asset ledger, then printing/creating $3 trillion isn't going to do anything but replace a portion of the destroyed money. 2. It depends on who gets the freshly created money. If all the new money/credit is flowing to the top 5% who already own most of the financial wealth, then it's difficult for demand from this small slice of society to create widespread inflation. If the interest rate is near-zero, then all those owning money are losing purchasing power, as official inflation is running at 3% and their yield on savings is less than 1%. As a result, those with money are seeking a higher yield. They are buying high-dividend stocks, rental housing, high-yield corporate bonds, etc. This generates asset bubbles in all asset classes that pay a yield above 1%. In other words, if the new money flows to the wealthy, then all it does is inflate asset bubbles. If the Federal Reserve created $1 trillion and distributed it in cash to 100 million households, it might increase demand for goods and services and spark inflation. But if the $1 trillion is only available to a handful of corporations and super-wealthy families, then it can't spark demand-driven inflation in anything but a handful of ultra-luxury goods. 3. It depends on the capacity to produce goods and services. The global economy is burdened with over-capacity: the capacity to produce steel, autos, flat-screen TVs, etc., far exceeds demand. Even if the Fed ordered 10 million new TV sets to be given away, this would not generate much inflation because existing factories could churn out the extra 10 million without even reaching full capacity. As for services--there is an over-supply of labor in virtually every sector, even ones that have traditionally been restricted: the demand for more lawyers is low, dentists' waiting rooms are often empty, and so on. In other words, a vast over-capacity also exists in most of the service sector. 4. It depends on values and priorities. Let's say the Fed created enough money to give each household $10,000 in cash--the famed "helicopter drop" of money. If most households saved the windfall or used it to pay down existing debt, very little of it would flow into the economy as demand for goods and services. The inflationary effect of all this new money would be essentially nil. 5. Cartels raise prices at will; this is not inflation. Cartels by definition have extinguished real competition (i.e. exposure to market discovery of price), and as a result they raise prices across their industry with impunity. In the U.S., healthcare, education, and defense (to name but three of many) are all cartels. As a result, costs in these industries never go down, they only skyrocket. This is not inflation due to an increase in money supply, it is a transfer of purchasing power and wealth from households to the cartels that superficially looks like inflation. If 95% of households are experiencing a loss of purchasing power and most of the new money and credit are flowing to the top 5%, you get asset bubbles, not demand-driven inflation. When 95% of the households are poorer in terms of purchasing power and financial wealth, where can demand-driven inflation arise in a global economy of massive manufacturing and labor over-capacity? The rise in costs within industries controlled by cartels (healthcare, higher education, defense, etc.) may look like demand-driven inflation, but are actually transfers of wealth and purchasing power from households to the government-protected cartels. Thank you, Paul, for the thrill of being a trillionaire, and for generously treating me to lunch. Thank you, Harvey D. ($100), for your outrageously generous contribution to this site -- I am greatly honored by your steadfast support and readership. Thank you, David C. ($10/month), for your superbly generous subscription to this site --I am greatly honored by your support and readership.